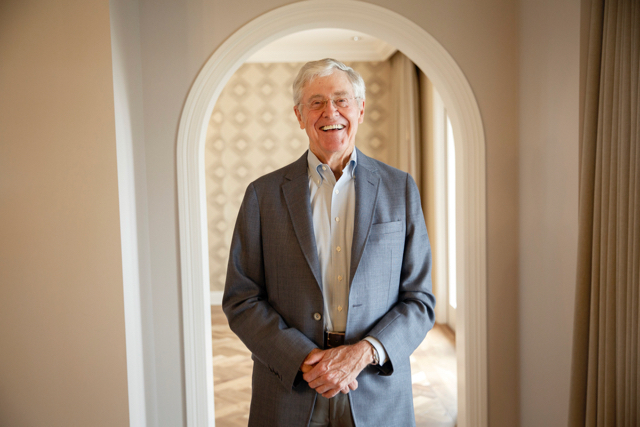 A constellation of political organizations funded by billionaires Charles and David Koch plans to spend almost $400 million to support conservative causes and candidates during the 2018 election cycle, the libertarian brothers said last month. Their flagship organization, however, has already been shoveling money out the door. Americans for Prosperity (AFP), a secretive Arlington, Va.-based nonprofit that’s refusing to release sections of its tax returns to the public, was the fourth-highest spending “dark money” organization during the 2016 election cycle, according to data compiled by the Center for Responsive Politics. It dropped more than $13 million during the last election in some of the nation’s most competitive races. But the nonprofit hasn’t been dormant since then. AFP emerged as a player in the battle over a $1.5 trillion Republican tax cut passed last year, promising to spend “several hundred thousand dollars on digital advertising, and follow it with more investments like direct mail, door-to-door visits, and other grassroots action around the country.” AFP also pledged to spend another $20 million to “educate the public about the benefits of the new law.” Under the new law, the wealthiest 1 percent of U.S. taxpayers, including the Kochs, will reap about 80 percent of benefits by 2027. The nonprofit also announced earlier this year that it would make “a significant investment” to ensure that more than 170 lower court vacancies — and any potential vacancy on the U.S. Supreme Court, where the average justice is almost 70 years old — are filled by conservative jurists. AFP launched a $200,000 campaign in Colorado last June to support charter schools and vouchers. The vouchers use tax dollars to subsidize student enrollment in private schools. The Koch-affiliated Libre Initiative has also touted school choice in 10 other states including Virginia, Nevada, Florida, Arizona, New Mexico, North Carolina, Ohio, Pennsylvania, Texas, and Wisconsin. The nonprofit was responsible for campaigns that would make it harder for unions to attract and keep members in New Mexico and Missouri. The AFP-backed measures, known as ‘right-to-work’ legislation, prohibit mandatory payment of membership dues to a union. AFP’s Tennessee chapter is pushing a movement to block a proposed sales tax increase that would pay for a revamped public transit system in Nashville. The $9 billion system upgrade would include the addition of light rail, expansion of bus services, and building of a tunnel under downtown. The nonprofit also spent $2.8 million on attack ads against Virginia Democratic Gov. Ralph Northam, who defeated former Republican National Committee Chairman Ed Gillespie in a November contest. AFP is the subject of an IRS complaint by MapLight for its refusal to release a redacted section of its annual tax return known as a Schedule B. The schedule shows the amounts of donations greater than $5,000 and can be used to determine the percentage of a nonprofit’s revenue from large contributions. The nonprofit argues that releasing information about the size of its donations would allow the public to identify its biggest donors. Although AFP claims to be a “grassroots” organization, information from a North Carolina audit showed that 76 percent of its revenue came from five donors in 2015. The state audit of the nonprofit’s 2016 books found that 81 percent came from five donors.